Stratolaunch and Sierra Nevada Corp. are teaming up to create a launch system to propel the Dream Chaser space plane into orbit. A private space plane may still carry people to orbit in the next few years, even though NASA passed the vehicle over as an astronaut taxi. Last month, NASA chose SpaceX and Boeing to fly its astronauts to and from the International Space Station, apparently leaving Sierra Nevada Corp.'s Dream Chaser space plane out in the cold. But Sierra Nevada is now teaming up with Stratolaunch Systems to develop a way to get a scaled-down version of Dream Chaser spacecraft off the ground. Dream Chaser was originally designed to carry up to seven astronauts and launch vertically atop a rocket. But the new vision calls for a three-passenger Dream Chaser to be air-launched by a giant plane developed by Stratolaunch, a company that billionaire Microsoft co-founder Paul Allen created in 2011 to make spaceflight cheaper and more efficient. "Combining a scaled version of SNC’s Dream Chaser with the Stratolaunch air launch system could provide a highly responsive capability with the potential to reach a variety of LEO [low-Earth orbit] destinations and return astronauts or payloads to a U.S. runway within 24 hours," Stratolaunch executive director Chuck Beames said in a statement. 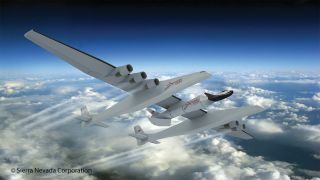 Stratolaunch Systems likely won't start test flights of its giant aircraft until 2016, company representatives have said. Sierra Nevada and Stratolaunch presented the new launch system idea at the 65th International Astronautical Congress in Toronto on Oct. 1. Sierra Nevada won multiple rounds of funding through NASA's Commercial Crew Program over the last four years to develop Dream Chaser but lost out on the final contract, which was announced on Sept. 16. The agency awarded SpaceX $2.6 billion and Boeing $4.2 billion to continue work on their Dragon and CST-100 capsules, respectively. NASA hopes at least one of these private American spaceships is up and running by 2017. The agency has depended on Russian Soyuz spacecraft to fly American astronauts to and from the space station since 2011, when the space shuttle fleet retired. On Sept. 26, Sierra Nevada filed a protest with the U.S. Government Accountability Office over NASA's handling of the final commercial crew contracts.